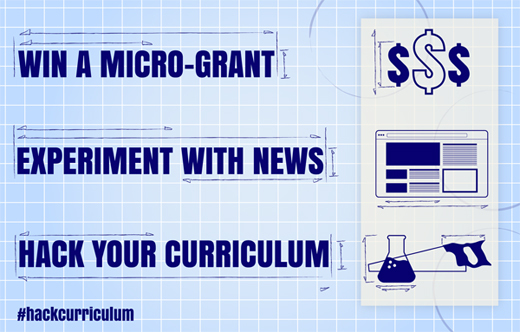 When we put out the call to J-school educators for the first round of experiments to #hackcurriculum for the Challenge Fund for Innovation in Journalism Education, we already knew we were hitting a rich vein just waiting to be mined. We saw the momentum in our Facebook Educators group, where a virtual cohort of nearly 600 digitally hungry and committed academics exchange rapid-fire ideas on favorite tools, curriculum tips, job openings, how-tos and student motivation. We heard it in the halls of our annual conference, where academic attendance is climbing and more and more mentors compete to work with the best and brightest in the Student Newsroom. And we hear it in the frustration of dedicated, multitasking teachers who are searching for the means to creatively engage their students in the community and embed them in local media. The four foundations supporting the Challenge Fund — the Democracy Fund, Ethics & Excellence in Journalism, Knight and McCormick — had long been on the same wavelength. The time was overdue to provide some space and support, up to $1 million worth, for experimentation in the academic and media ecosystem. Three months later, our selection committees were looking at 125 applications from schools small and large, from all over the United States, to pick the first round of winners for the two-year fund. Bright shiny things and gee-whiz technology were not the goal. We wanted to see true community engagement and impact, at a level of success that would be replicable in other schools. Will students learn to produce new kinds of news in open collaborative teams? What do they want to find out with their experiment? How will their community and local news outlets benefit? We’re delighted to see and support so many community-centric ideas in so many schools across the land — so many, in fact, we had to also pick 13 honorable mentions. When we open up entries later this year for the next round of funding, we hope those great ideas will get richer, and we’ll see them again in renewed form. Where do we go from here? Just like any experiment, we’ll have to see what develops as research comes in, so watch this space. As executive director, Jane oversees and manages the day-to-day operations of the world’s largest membership organization of digital journalists, working closely with the Board of Directors. Her purview includes membership, partnerships, global community outreach, budgeting and revenue generation, fundraising and development, the Online Journalism Awards, and providing vision for ONA’s state-of-the-art annual conference.